Mod works fine for me. Even after I got my Barony. I haven't used the (Cheat) options though, only game-speed. Unable to work after DLC2 updates. I guess we'll have to wait for an update. [FastTravel] [Error] OnToggle: MissingFieldException - Field 'Kingmaker.Blueprints.Root.BlueprintRoot.GlobalMap' not found. MissingFieldException: Field 'Kingmaker.Blueprints.Root.BlueprintRoot.GlobalMap' not found. Edit 2 - World Map travel works, but seems like it's no longer "Fast." Small price to pay. Does this mod work with Unity Mod Manager 0.13? Everything was working fine for me with this mod. However, after I gained my barony, the Global speed (not cheating one) does not seem to work anymore. Exploration still works fine, but global speed only goes at 100% no matter what speed I set. How did you know it didn't work? Try restarting the game. I tried restarting, still same. I know it stopped because when I moved on the global map when it was working was quite fast. Now it is the same speed as base game before mod. Mod does not affect the speed. It shortens the time. Very nice QOL mod, good work. Is there a possibility to add a keybinding for turning mod on and off? Or switch between 2 pre-defined speeds? Thanks for the update! The only thing I can't get to work is Increasing party speed/Global map. Traveling speed on the global map doesn't seem to increase when using that slider. I does work when using the Increasing game speed/Global map slider but Increasing party speed/Global map does nothing for me. Does one option have priority over the other? I want to have game speed unchanged, so I leave Increasing game speed/Global map at 100% and set Increasing party speed/Global map to 200%. Am I doing something wrong/anyone else having this problem? The first way affects the animation, the second does not affect the animation. Yes but the second in this case (Increasing party speed/Global map) does not seem to work. That's what I was trying to point out. I'm trying to increase to speed on the global map without speeding up game time, so I'm using "Increasing party speed/Global map" and set it to 300%. It doesn't seem to do anything though. Does it work with this latest patch too, I wonder? for some reason the mod is causing a hang at the first loading screen again for me. 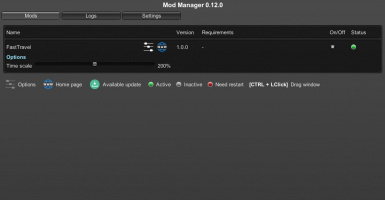 I tried what I did last time which was reinstall mod manager, but it didn't fix it this time hoping for some advice fixing it. Try to install only Fast Travel mod. Only had fast travel mod on and it hanged on the first loading screen again. Still not sure what's wrong. I will clarify that the mod is incompatible with the old game version. That is strange because I am updated with the latest patch which is 1.1a. when I typed 1.1a that was on the steam news page, in game it was 1.1i don't know if that makes a difference, even though a new patch just came out so I will check again.